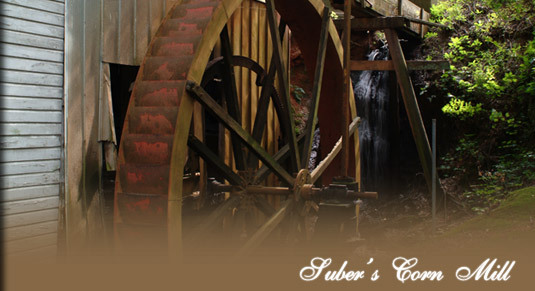 Suber’s Corn Mill is just one of a handful of grist mills still operating in South Carolina. Located in Greer on Suber’s Mill Road, just a short drive from downtown Greenville, Suber’s rests on the slope of a hardwoods-covered hill in the Upcountry. Water from a holding pond above pours down a wooden chute and spills onto the paddles of a large vertical wheel, keeping it in a steady, rhythmic spin. Driven by a wheel, gears, pulleys and shafts turn slowly inside the wooden building. Shelled corn is fed into a chute on top and gravity sends it tumbling to the crushing millstones below. One floor down, the fine white powder emerges where it is bagged and stacked for sale. This mill, built circa 1908, still grinds corn using water power.